Ideas are limitless when you combine wood and iron. 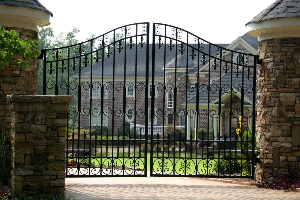 Check out online images of wood and wrought-iron gates to get inspiration. You can also work closely with an expert from a team of gate design and installation technicians for advice. He or she can recommend materials and overall designs if you aren’t sure which types of wood or which looks you want. When you have your own one-of-a-kind entry gate, you have the basis on which to build a dream property. Add matching wrought-iron and wood fencing in the front or back yard to extend the great looks of the gate. Copy your gate motif in wooden planters, iron trellises, and combination lamp posts. Paint your wrought iron to match your home’s trim colors or leave it black to match black wrought iron or aluminum fence sections. A fine entry gate inspires you to add decorative touches throughout the landscape. It guides visitors into your private space with flair and elegance. Additionally, these gates stand strong and beautiful for decades. In fact, many historic wrought-iron gates have lasted hundreds of years. If you have the finish of your wrought iron cleaned occasionally, it should last many years too. Should you choose to have the wrought iron painted, be sure the paint is checked annually for chips and cracks. These openings allow water to pool next to the iron and cause rust, so painted wrought iron should be sanded and repainted on occasion to stay in great shape. Wooden elements of your fencing also need upkeep. Applying stain, paint, or waterproof sealant every few years is recommended. Wood gate pieces should be inspected once a year for cracks, insect damage, and rot. Depending on the design and type of wood used, it’s relatively easy to repair or replace any failing wooden gate parts.